Contents: 18 Sprues Olive Drab Styrene plus separate styrene cab and two separate trailer sprues; 1 sprue chrome parts; 1 sprue clear parts; 2 photo etched steel frets; various pre-cut metal plates, shafts, pipes, hinges, rods, screws, washers and wire; two lengths of brass chain; poly caps; string; 18 hollow rubber tyres. Advantages: A mind boggling, multi-media celebration. Tamiya's best military kit yet (and therefore the best military kit yet!!). Disadvantages: Not for beginners - complex construction. Some annoying ejector pin marks. This is not a model. It is a demonstration of power.
" the box seems to shout "to tackle such a subject in this totally uncompromising way". Tamiya and Dragon have been slugging it out over the last decade or so - to the great benefit of the modelling public. From my point of view, Dragon have had the edge in originality but Tamiya have reacted with higher quality products. 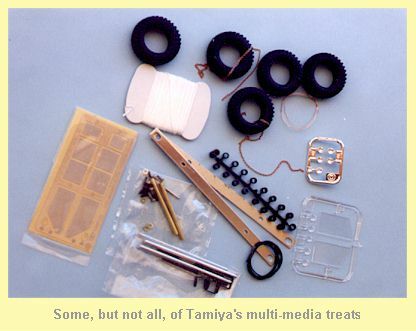 However, Tamiya's subject matter has continued to tread safer, more conservative ground. Tamiya's Dragon Wagon is (almost literally) breathtaking. It is Tamiya's first truly multi-media military model - see the parts list in the table above. It is not a model for the feint of heart. The contents are daunting if only for their sheer volume. 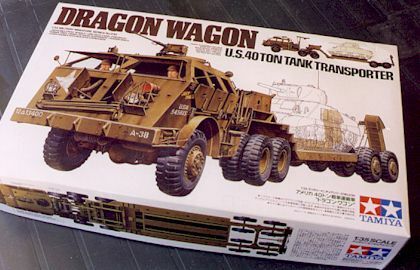 In summary, though, the Dragon Wagon shines with typical Tamiya class. Apart from replacing a few two-dimensional handles here and there, this is a model that all but the most dedicated detailer will build straight from the box. Everything that opens and shuts can either be positioned, or actually operates. The latter include winches, hoists, ramps and even steerable front wheels. Detail is equivalent to Tamiya's best and most recent. Imagine their Greyhound multiplied by ten! The cab is beautifully equipped. Winches are mini-models in their own right. Sub-floor detail, including woodgrained stowage areas, is provided. Truly spectacular. A four-man seated crew is supplied. One GI is even equipped with a magazine for amusement! Other innovations include chrome inserts for headlights/spotlights, perforated brass wraparound muffler, and the most realistic tyres I have yet seen in a model. These are not vinyl - they are real, hollow rubber tyres. They even smell right! Decals are another highlight. Four options are available. The colour "pinup art" supplied with one option really looks like its been painted. 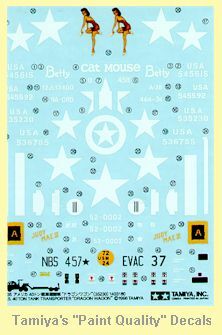 I'm looking forward to seeing this quality of production in Tamiya's future aircraft releases! The instructions maintain the remarkable standard. A 28-page book contains a few pages of history, a list of parts, 39 construction steps and five diagrams illustrating loading techniques and suggested loads. The kit will almost certainly build up with the same level of logic and ease as all of Tamiya's recent offerings. This is simply the best military model that I can ever recall seeing. Even if you are not excited by the subject matter, you should at least look at this kit. It will be a long time until you see a more powerful demonstration of the model manufacturer's craft. And think of all the diorama possibilities. So many possible loads - Panzer IV or Panther, two light tanks at once, Shermans. The list is endless. Finally, is this kit expensive? I guess it depends on your personal budget, but it sure is good value! How many of us have spent over $100 in accessories on a $30 kit? Thanks to Ray Blythe for his selfless sacrifice in forwarding the kit for review! This Page Created on 29 December, 1998.